The Browns' official podcast is the 14th most popular sports podcast. WTF? 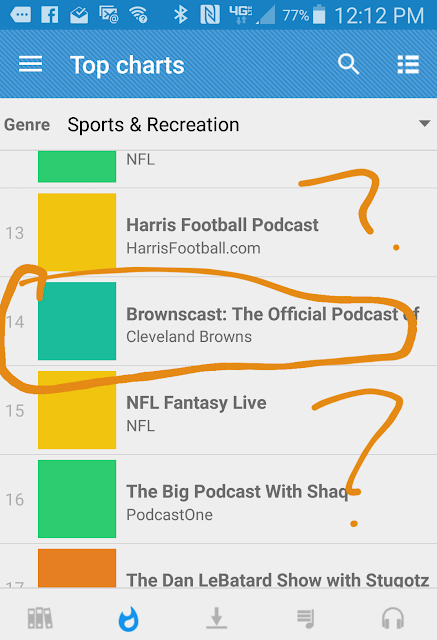 Perusing sports podcasts this morning I found that the Official Cleveland Browns podcast is the 14th most popular podcast in the sports category. What? The top of the list is predictable..ESPN fantasy, Mike and Mike, Dan Patrick, etc. But then out of nowhere the Browns show up only one spot behind Grantland and above Shaq, the Official NFL podcast, ESPN First Take, Tony Kornheiser, Dan Le Betard (ok I understand some of these), and many more national names. I don't get it. Unless it's the 21st century audio equivalent of rubbernecking at a car wreck.